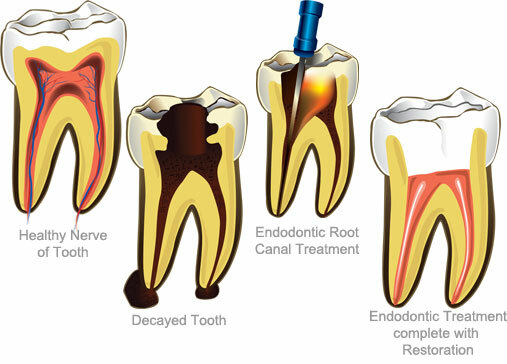 Root Canal Therapy is usually needed when a tooth has undergone extensive decay or a fracture. Unfortunately, with extensive decay and fractures comes pain. Root canal therapy alleviates the pain and is often times the only alternative to prevent an extraction. Root canal therapy can be defined as the removal of the pulp (nerves) of the tooth, the subsequent cleaning of the canals and the filling of the hollow canals with a filling material. Normally root canal treatments are done in more than one visit. During the first visit, the pulp of the tooth is removed. The pulp consists of a bundle of nerves and blood vessels and is located in small canals inside the root of your tooth. The roots of our teeth are very intricate structures, containing various sized canals. Sometimes these canals are curved and sometimes they are fused or split off. Small rotary instruments are used to remove the nerve bundles and an irrigation solution is used to clean and rinse. A medicinal material is then placed inside the tooth, and a durable temporary restoration is placed. Some pain or discomfort can be expected after this visit, but should be manageable. There is usually a minimum of 7 to 14 days in between the first and second appointment. On the second visit the canals are cleaned out further, and also shaped and widened. This can take some time, and this visit is usually at least one hour long. The root canals are then filled with a special filling material, and sealed off. Normally a crown or overlay is placed on the root canal treated tooth to protect the weekend root structure and restore the tooth.